LOS ANGELES — A U.S. Congressional Delegation comprising Tulsi Gabbard (D-HI), Anna Eshoo (D-CA), Frank Pallone (D-NJ), Jim Sensenbrenner (R-WI), Jackie Speier (D-CA) and David Valadao (R-CA) was in Armenia and Artsakh. 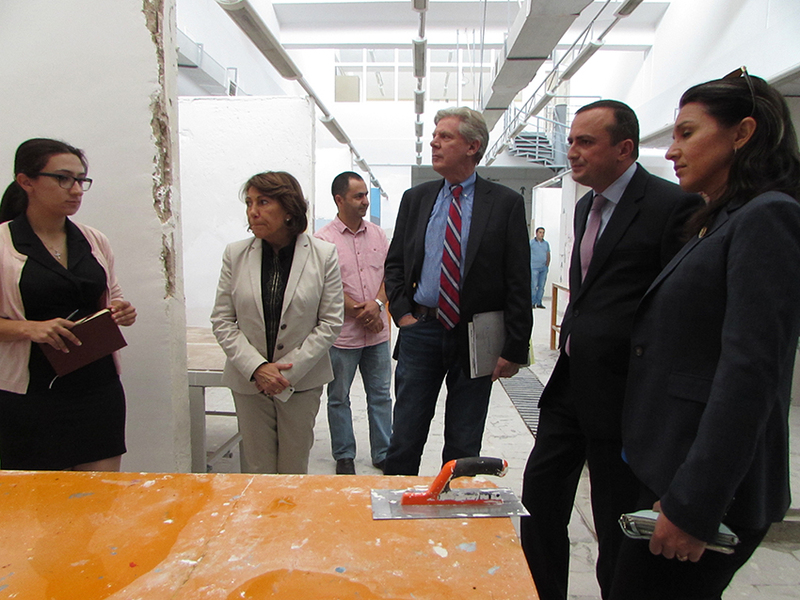 On their visit to Shushi, the Members of Congress visited the Technical College established in 2016 by Hayastan All-Armenian Fund with the bequest of a French-Armenian benefactor Yeznik Mozian. The College provides a three-year technical degree in a variety of construction-related specialties to more than 150 students aged 12-18 from Artsakh and Armenia’s Syunik province. Education, room and board are free at the college. In Yerevan members of the congressional delegation met with the Executive Director of Hayastan All-Armenian Fund, Mr. Ara Vardanyan, who briefed the lawmakers on the history of the organization, its most important accomplishments as well as its sophisticated system of accountability and quality control that over years became a golden standard in non-profit project implementation in Armenia and Artsakh. After the meeting members of the delegation visited the Tchaykovsky Music School reconstructed by Hayastan All-Armenian Fund in 2016 with a $2.5 million grant from Armenia Fund USA, a New York based non-profit. To the delight of the guests, students from the school performed a small concert. While visiting the town of Gyumri, the congressional delegation paid a visit to the Orphanage for Children with Physical and Mental Disabilities reconstructed by the Fund in 2012 with a $500,000 grant provided by Fonds Armenie Suisse (Switzerland) and Armenien-Fonds e.V. (Germany). Home to 121 children, the orphanage is the only preschool institution in Armenia that provides round the clock care to children with special needs aged 1-6. “The U.S. Members of Congress had a strong desire to learn more about Armenian Diaspora’s involvement in Armenia’s and Artsakh’s development. Hayastan All-Armenian Fund, the largest Armenian charity focused on implementing large-scale humanitarian relief, social infrastructure and development projects in Armenia and Artsakh was a natural choice. A large number of Hayastan All-Armenian Fund’s projects are being implemented through grants from Armenia Fund, Inc. and Armenia Fund USA — U.S based partner organizations that have cooperated with the pan-Armenian charity since 1994. The Congressmen were impressed with the organization’s proven 25-year track record of making a country – wide impact in Armenia and Artsakh. It is encouraging for us to present the excellent work of the Fund to them and hear their desire to find ways to allocate resources allowing us to widen our humanitarian and development mission in Armenia”, said Maria Mehranian, President of Armenia Fund, Inc.